Egypt Travel representative will pick you up from your hotel in Cairo, then drive to Alamein, about a 3 hour drive. At Al Alamein, you will enjoy the site where the great battle took place during WW II, and visit the WW II Museum and the Cemetery. Then drive on to the beautiful bay of Marsa Matrouh on the Mediterranean Coast then continue to Siwa. It is about a 06 hour drive from Alamein to Siwa. Dinner and Overnight in Siwa. 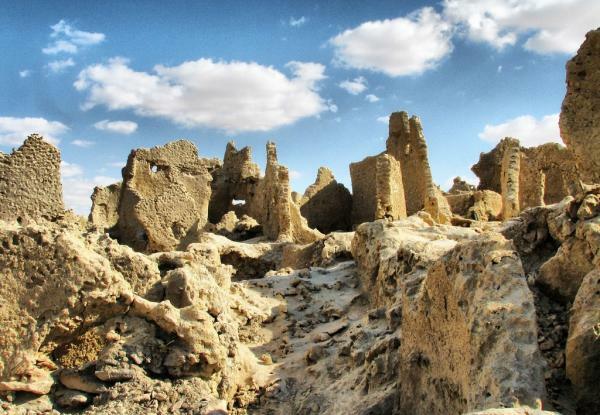 Breakfast at the hotel – then enjoy the visit to the Old City of Siwa ( Shali) – then continue to Visit The tombs inside the Mountain of the Dead ( Gabal El Maouta ) enjoying watching some interesting tombs like SI Amon, MSW Isis, Crocodile Tomb. Then transfer to Abu Sherouf, one of the Siwan Villages to enjoy the Bedouin style life and enjoy the Roman Spring eye and handcraft. Live the imaginable Sunset at Al Awsat lake. Back to your hotel. Dinner and overnight in Siwa. Breakfast at hotel, visit Cleopatra bath and the Alexander Temple, at Aghurmi Village which is dedicated to the God Amon- 26 Dynasty. Lunch is included. After that transfer to see the Siwa House Museum. Then another recommended Sunset view at most of the guide books at Fitnas Lake. Overnight in Siwa. Breakfast at hotel – Then start our journey at the Siwa Desert start first with Abu Ali Village. Cross the desert to stop near one of unique archeology sign at Great Siwa Mountain where is the first human footprint above the mountain which date to pre-history era. Continue our Safari tour between the dunes till we arrive the fossils area and see the rocky coral reefs which date to Cambrian era the drive to One of the spring eyes at the middle of the desert ( Shiata Lake) and it is a good chance to watch the Flamenco birds .Then it is chance to Enjoy the sand surfing at the desert before we go to swim at cold spring and enjoy the bath and relaxing atmosphere - Then it is the time to drive to another springs the hot spring for chilling and tranquilizing our Muscles – Ending our day with watching the Sunset at the desert with the Bedouin Tea – Drive back to your Siwa hotel. After breakfast, transfer to your accommodation in Cairo.